This week's Coles Catalogue offers a classic range of pantry, grocery, fresh produce, meat, deli, and bakery products in the food section which might be referred as the first half of the catalogue. In general, they have half-price deals as one of the primary discounts. That shelf covers everybody's favourite things at a lower price. We can also see South Asia's beautiful packaged food products like Passage to India butter chicken simmer sauce, coconut cream, and like-class foods. Regular needs like vegetable oils, canned soup, sauces, rice etc. are available on pg 11-13. Save $1 on Sirena Tuna, $1.88 on Barilla pasta sauce, $1.25 on John West Tuna 425g, and save even more on many likable foods. Breakfast is one of the major categories of all Coles Catalogues including this preview. You may buy SPC peaches, So Good Almond milk, Nestle Milo, Kellogg's Special K, Coco pops, Vegemite, Nutella hazelnut spread and more products at half prices or lowered prices. Besides, these are not all the things you can find at Coles stores. Check out easy meal ideas by Coles. Find chicken schnitzel soft taco and chicken kiev with Kaleslaw on pg 16-17. More attractive discounts and special meat and seafood offers can be seen on pg 18-19. Prices are reset every week. Lamb meat, deli lunch meat, excellent selection of seafood products and similar sort of things are also the featured items. Save $2.50/kg on Coles Australian lamb boneless shoulder roast. 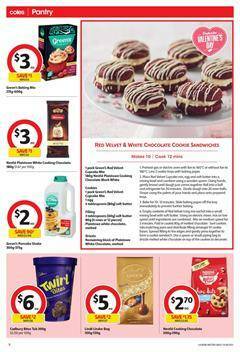 More half-price deals are available on Coles Catalogue. You will come across with the half prices on Mars ice cream varieties, Creative gourmet frozen banana chunks, Hong Kong frozen snacks etc. on pg 26-27. Follow our Facebook page or Twitter to get notifications about the future Coles Catalogues.